Lights, camera, flavours and action. There is nothing that defines South Asian culture more than the mesmerising world of Bollywood and the culinary delight of desi food. Bringing these two quintessentially South Asian phenomena together is an unforgettable Bollywood-esque celebration in the heart of the community – Wembley. Why the celebration of Bollywood and desi food in the UK? Well, this relationship goes all the way back to 1931. Eight decades ago when Bollywood made its multisensory debut on the big screen with Alam Ara, UK was introduced to authentic South Asian spices with the birth of Rajah Spices. As Bollywood moved from the era of silent cinema and embraced the sensory power of music, special effects and dialogues, the South Asian diaspora crossed the seven seas to make the United Kingdom their home. As the director of the film Ardeshir Irani recognised the importance of sound, an Indian army officer in Britain valued the importance of the taste of home, bringing spices to the UK with Bombay Emporium. While Alam Ara introduced the sub-continent to an “All living. Breathing. 100 per cent talking” cinematic experience, Bombay Emporium soon became Rajah Spices introducing 100% authentic flavours to the UK. As time went by and the romance of musicals and larger than life settings encapsulated our imagination, the diaspora here in Britain added a desi twist to their meals be it a Masala Shepherds Pie or a Tikka Spaghetti Bolognese. The vibrancy of our cinema reflected in the colour of our everyday cooking, with the star power of fresh authentic spices, adding a sprinkle of stardust on every dish – be it a humble daal or a lavish roast. Becoming an everyday essential, adding flavour to every cuisine, making it everyone’s taste of home – South Asian spices became a British mainstay – adding vibrancy and aromas to every household. South Asian food and films ran a parallel journey, influencing and inspiring the life of every UK family from the kitchen to the dining room all the way to the big screen. On the 23rd of March 2019, London Designer Outlet in Wembley will be taken over by award-winning ace Bollywood choreographer, Shiamak Davar’s dance troupe along with UK’s voice of Bollywood, Anushka Arora to give passers-by the authentic taste of home with some sumptuous desi delights. Encapsulating this extravaganza and splendid journey of eight decades in one weekend will be Shiamak Davar’s troupe. 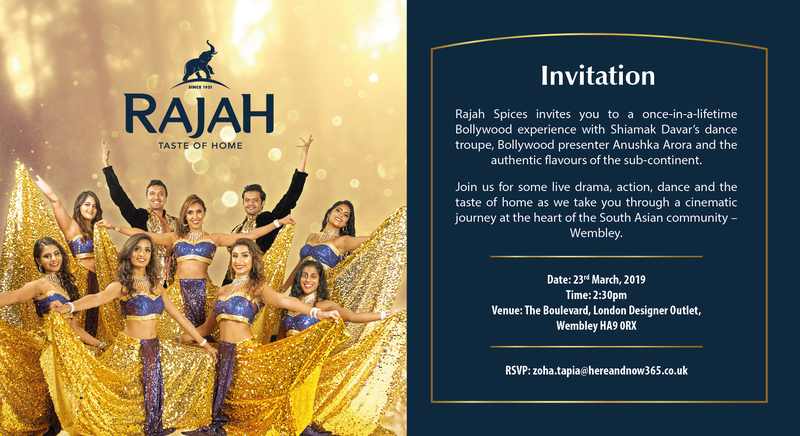 Their larger than life dance performances will combine with the tadka of Rajah Spices with unique desi-flavoured popcorn and Masaledar freebies – all under one roof for one day only. Join in the celebrations with the glamourous Anushka Arora and immerse yourself in the cinematic world of Bollywood, at the London Designer Outlet, from 2-5 PM on Saturday the 23rd of March 2019.